It is a day set aside for Christians everywhere to consider the plight of the orphan. And the role we might play in being Christ’s hands and feet to serve and care for orphans worldwide. On Orphan Sunday, Christians stand for the orphan. We are a people called to defend the fatherless… to care for the child that has no family… to visit orphans in their distress. From many sources, one voice. Hundreds of events across America and beyond, all sharing a single goal: that God’s great love for the orphan will find echo in our lives as well. Each as they are led. Sermons and small groups, concerts and prayer gatherings—each rousing believers with God’s call to care for the orphan… and what we can do in response. November 8, 2009. 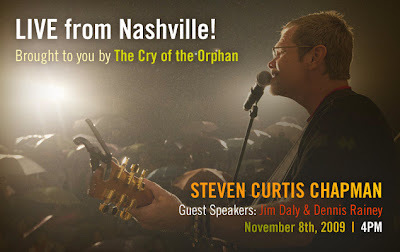 Orphan Sunday is your opportunity to rouse church, community and friends to God’s call to care for the orphan. Please spread the word to your family, your loved ones, your friends about this very special day. Encourage them to watch the broadcast. Encourage them to pray about how God might want them to join Him in caring for the orphan. Go here to view the LIVE broadcast, starting at 4PM CST. I'm there! I'm SOOOOOOOOOO glad you posted this because I couldn't find any local churches who were broadcasting this awesome event. I had NO IDEA it was orphan Sunday today as I held my daughter from China and praised God with the church. 2 new baby boys from Rwanda came with their family and we were short one family because the Mommy and Daddy are in China getting TODAY their long-awaited daughter, Isabella. I had more reminders of adoption, the least of these, and those who are fatherless. I share that because I can tell there are prayers going up for the orphans, for the hearts of mommies and daddies to pursue the children God always intended to be sons and daughters. Please pray with me! It's when we are helpless that we cry out. The doubts will rush in. There are so many of "the least of these" and our own resources are not enough (spiritually, financially, mentally, physically). I can't imagine how God smiles as He provides families for the fatherless. He cares for the fatherless. He owns the cattle on a thousand hills. He sent His Son to die for sinners. He cares, do we really care? He can provide. Can we trust Him to do provide? He died to redeem! Will we allow Him to use us to redeem the orphan? Please consider with me how He might use us to provide.